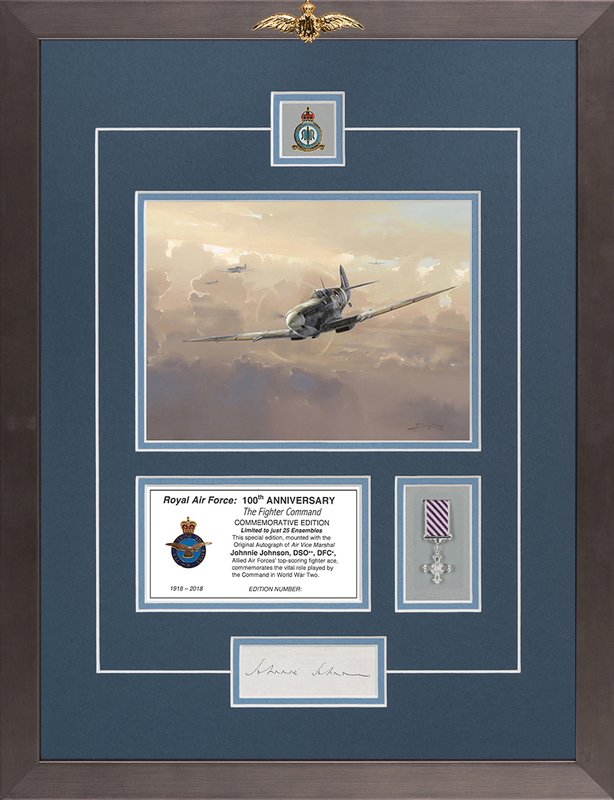 Commemorative Fighter Command Edition - Limited Edition of 25. This very exclusive Limited Edition of just 25 Ensembles specially celebrates the 100th Anniversary of the Royal Air Force, paying tribute to the brave aircrews of Fighter Command. RAF Fighter Command’s motto is “Offence-Defence”. When called upon, throughout the Service’s 100-year History, its pilots and crews have performed these vital roles beyond the call of duty with unflinching dedication. In Royal Air Force Fighter Command’s long history of front-line service, there was never better example of character, leadership, and raw courage than that demonstrated by the fighter ace chosen to represent and remember the deeds of the men of RAF Fighter Command. he flew Spitfires during the Battle of Britain and throughout the war, becoming a Wing Leader and Commanding the Canadian Wing after D-Day. He became the RAF and Allies top scoring Fighter Ace of World War Two. Each edition is available mounted & framed or unframed (please see Options below). Each display is completed with dramatic artwork, a gold & enamel-finished Royal Air Force badge, a miniature ceremonial replica DFC medal finished in real silver plate (more DFC’s were awarded in World War Two than any other bravery award), and a matching numbered Certificate of Authenticity.